Happy Friday. I realized today that I've been so busy this week with my Cupcake Contest that I've just been pumping out updates here and not really talking to you much....and I know how you like it when I talk. So first, I will say that wowie zowie, isn't this bangle bracelet wild? I've had those transparent discs for a long time and their color is so unique that I've been waiting to mix them with just the right beads...and these are it! I had fun with the wire wrapping which I don't often do. The details and more pics can be found HERE. I've made more jewelry this week than usual and it's been motivating, even if it is all cupcake related. I mean, there are millions of bead styles out there, but I still keep coming back to being the most amazed by cupcakes. And oh my gosh, wait until you see the ones that are coming to my studio! I found a "new" glass artist...new for me, anyway. She only posts new beads a couple of times a month and when looking through her website gallery I saw cupcake beads unlike any I'd seen before. They have different detail than I'm used to and was awed by them. I emailed her letting her know my love of cupcake beads and her particular style and she said she was making some this weekend, and what colors would I like to see her work with! Yep, she's giving me first dibs on them and I consider myself very lucky. Even I don't know what they are going to look like yet but I know they'll be awesome. My color requests and her glass work...it's going to be a great mix, I just know it. There is nothing more exciting than collaboration. So, in other news around here, baby house finches are chirping like crazy when they are hungry...and WHEN are they NOT hungry! Man, the are the most insistent shortly after sunrise. For a tiny bird they sure make themselves known in the neighborhood. Okay, was that enough chatter from me? I hope so. Tomorrow is the last day for contest entries so if you haven't done all you can, remember you can have at least a dozen of them for yourself! Oh man did this bracelet ever turn out yummy! I just listed it in the SHOP so you can see more photos & details there. I have a necklace and earrings that will be listed later today in the shop as well so stop by and check them out. You still have three more days to enter the Cupcake Goody Contest! Hi contest fans. Be sure you check out my Cupcake Goody Contest for this week. I'm releasing at least one fresh cupcake jewelry item each day this week which might help you be one of three winners. This incredibly delicately colored lavender glass is pretty amazing. With its white icing and matching rosebuds I am in awe how pretty these turned out as earrings. Below is another pair with really cool plum colored glass that has this hint of chocolate that makes the color very unique. You can see how when it was used in a much thinner application as the "sprinkles" that is when the chocolate brown color is more noticeable. Come see more details & photos in my SHOP. I'll see you tomorrow with more goodies...and as always, good luck to you. You saw my previous post for the Cupcake Goody Contest, right? Be sure to check it out so you can be one of 3 winners! Each day this week I am releasing one more cupcake jewelry item and announcing it here so be sure to keep coming back. See more details on these scrumptious "Evening in Paris" rosebud cupcakes in my SHOP. See you tomorrow, and good luck on the contest! Well, I haven't done this in a long time so I'm having a wonderfully easy contest where ALL the prizes are cupcake related. This darling magnetic papered photo frame goes to the big winner, along with the cupcake shopping list & napkins. And all three of you will win 2 cupcake lip balm tubes AND 2 cupcake shaped lip balms! Yum yum, just look at all those tasty flavors...lip smackin' good! I thought of having more winners, but decided I just wanted to have the winners WIN more. With all these lip balms, you can keep them or surprise your friend, daughter, mom or other cupcake lovers with one...or two. Visit my Cupcake Jewelry shop HERE. Look through the 2 pages of beautiful jewelry, then COME BACK to this post and leave a comment telling me your favorite pieces of jewelry and WHY they are your favorite. This will help me know what yummy beads to pick up for future jewelry items. Commenting will give you ONE entry into the contest. So will becoming a follower of this blog. Every item of jewelry you purchase in the shop will give you FIVE more big fat entries. And Twittering or blogging about the contest will EACH give you THREE more entries. BUT BE SURE you leave in your comment your blog address entry or the link to your Tweet so I can enjoy it too or you won't get the points. That's it...at LEAST a dozen possible chances to win, yahoo! Contest runs through this Saturday night. YOU MUST leave me either a link to your email or type your email address in your comment. Otherwise, I can't contact you when you win! PLUS, each day for the rest of the week I will be releasing NEW rosebud cupcake jewelry in my shop displaying an incredible array of color combinations so be sure to come back to see them. I only get these rosebud cupcakes on rare occasions so you've got to move fast when you see ones you must have. 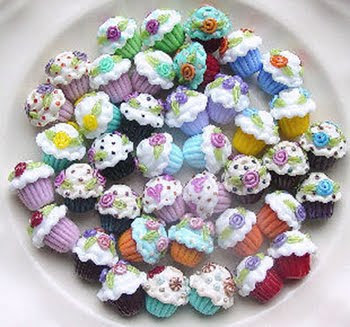 photos of those cupcake beads...and they are gorgeous! UPDATE: It's Monday, April 26th and I'm working on your surprise, so come back later tonight. Hi all. Our weather has been interesting here in this part of California...rainy for a few days and then amazingly perfect for a few days...back and forth. Right now we are in the amazing status once again so I'm sharing it with you in my bright and sunny friend above. I'll be back on Monday with a big fat surprise for ALL of you...hmmmm, what could it be? I'll just say it's cupcake related, so it's GOT to be good, right? See you Monday. Did I get your attention??? Here are 2 darling pendants I made this morning. They make me feel like I'm at a carnival, especially the sprinkles. I decided to leave them as pendants so you could suspend them from any chain, cord or ribbon in your jewelry box. Gives you more versatility that way. email me through my shop where you can see more DETAILS. to keep an eye on my SHOP for more of those. We had a spectacular weekend and now rain is moving in again for a couple of days and then we are back to spectacular...I'll take it! I hope your weather is settling too. I know I already posted today, but I just HAD to show you the next batch of cupcake earrings. They are so fantastic with all of their color combinations and totally different themes. Oh man, these are so pretty. I finally got down to work on these new cupcake beads I've been showing you. These are only 2 of the styles...and I have TWELVE more different styles to show you! One even has an ocean theme...amazing. Many of them have these fabulous sterling silver ear hooks that have CZ (cubic zirconium) crystals in them so that gave me one more dimension of color to work with along with the Swarovski crystals that top each cupcake. I mean, just look at all those rosebuds...weeeeeee! Now, please be aware that the glass artist doesn't often make these so I snagged as many as I could and will be rolling out more next week. I'm going to visit family for the next three days and won't be able to post more earrings until Sunday or Monday. You can see more photos and details HERE. We were spoiled with a week of glorious, perfect California weather and now it's raining....raining and raining. 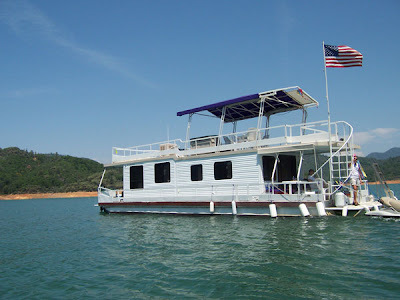 My sister will be so happy to be back on a houseboat this summer with her family & friends. Her favorite lake's water level has been too low for this type of recreation for the past 3 years! They'll be floating high and happy in their private coves this time around while spotting eagles, reading and tanning. I promise I'll be back this week with luscious cupcake earrings in styles you've not yet seen from me. Cash flying into the piggy bank this week since I helped my son with his first tax return ever. Geez, how many lines were there between the federal form and the state? Over 150 in total! Had to back him up a few times as he tried to whiz through what he needed to read and decide on for each line....sheesh. All that for less than $100 in returned cash to his piggy bank. Glad THAT only occurs once a year. It was frustrating knowing that he had the least info possible to fill in (since he hardly earned anything) but knowing that he had to learn to carefully fill the forms because if there is an error, oh how the government would love to hunt you down! 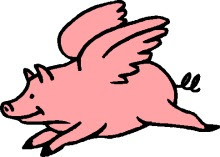 But, it's all done now and I figure he has a more serious understanding of it, so all's well...whew! For those of you having glorious almost summer like weather, I'm with you on that! For those of you under water or still under snow, I'm thinking of you too, knowing you'll soon join us. Keep your heads up. Pretty isn't it? I just love the unique design of this cupcake and that it is garden themed...WOW. Just look at the amazing flower work and the lovely indentations on the icing....which is not just chocolate, but a deep mahogany color with just a touch of red in just the right light. Keeps it from being a flat brown. Beautiful, just beautiful. The cupcake is listed HERE. Tomorrow is Easter. If we visit my husband's family there is a big dinner celebration. But we'll be home this year and we just enjoy the belief that we celebrate Christ's rising from the dead and all that it represents. Our son is 22 so no egg hunts here! I cannot believe I've been gone for a week! Remember these cupcakes from a few weeks ago? Well, I'm working on them to turn them into sweet jewelry, so I'll be back soon with pictures of the finished products. If you want to know when they are finished, you can email me HERE and I'll add you to my newsletter list.